Those of you who enjoyed my post in February about film critic and curator Iris Barry may be interested in attending a Barry-themed film series taking place right now at New York’s Museum of Modern Art. Iris Barry: Re-View features films Barry chose for a program at Hartford’s Wadsworth Atheneum in 1933 that would gauge public interest in film as an art form. The program paved the way for MoMA’s film library, which Barry went on to curate. The series also includes the Mae West classic She Done Him Wrong (showing tonight!). If I had time, I’d make you a Mae West recipe. I promise to figure out a way to include one on these pages soon. In the meantime, I hope New York-area readers will try to make it to some of the films this weekend. Here’s the link to the Museum’s information on this series………. Long ago and far away, I wrote a not very fascinating master’s thesis about a person who was very fascinating indeed. 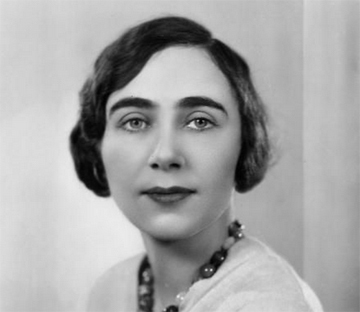 Iris Barry (1895-1969) was one of film preservation’s heroines. This chic Britisher was an influential film critic in London in the 1920s, writing for three separate periodicals—the popular Daily Mail, the literary Spectator, and the fashionable Vogue. A founder of the London Film Society, she was one of the first people in Britain—indeed, in the world—to call for films to be preserved. Barry moved to New York in 1930 and cultivated friendships with a number of people in the city’s artistic and philanthropic circles. 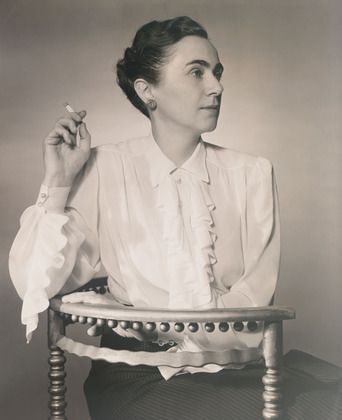 In 1932 her contacts paid off; she was asked to establish a library at the Museum of Modern Art. For the next 15 years she helped invent and establish the whole idea of saving and curating films. Barry wrote in her autobiographical notes that the accomplishment of which she was most proud was that after her work at MoMA, she believed that “films would be dated like fine wine.” Before her, this was not a convention of film culture. I hadn’t thought about Barry for years until a few days ago, when I read about a wonderful idea and cause. 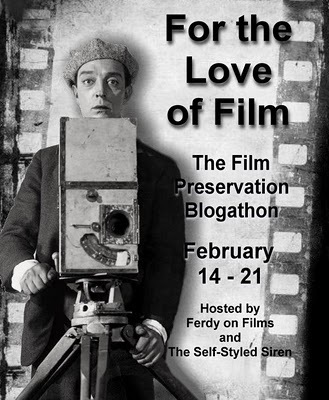 This week Ferdy on Films and the Self-Styled Siren are organizing a blogathon called For the Love of Film to highlight the ongoing task of film preservation and to raise funds for the National Film Preservation Foundation. I decided at once to participate—and to resurrect my research on Iris Barry. My thesis dealt with her early work, particularly her writings for the Daily Mail between 1925 and 1930. Unfortunately, my notes (if they still exist) are in another state, and I haven’t had a chance to get there to look for them since I heard about the blogathon. So I’m sharing with you a few of my memories of Iris Barry—old, secondhand memories, but vivid ones nonetheless. Barry was conscious from the very first of her role as a promoter and defender of film. Her 1926 book Let’s Go to the Pictures (titled Let’s Go to the Movies here in the States), like her criticism, embodied the different personae she adopted in relation to film. Barry was conscious of her membership in London’s artistic and literary circles. A protégé of Ezra Pound, she had written poetry and fiction before finding an occupation in film criticism. She wanted to establish film as an art form and to define the sort of art form it might be. She also saw herself as an unabashed film fan—a lover of the experience of going to the movies as well as of individual films and stars. It was in part this schizophrenic nature of Barry’s film criticism that drew me to her. She could heap praise on Felix the Cat (whom she called “an institution, a totem”) as well as D.W. Griffith’s masterwork Intolerance. I believe that most of us who have written about film and its history share this duality. We want to study and preserve films because they can be rich examples of cultural history or magnificent works of art. We also want to study and preserve them because we grew up getting a thrill from westerns or thrillers or screwball comedies, from Clint Eastwood or Ginger Rogers or Anne Hathaway. Like Iris Barry, we are all fans of the flickers. One of Barry’s other appealing characteristics as a critic was her insistence that “[t]he Cinema exists to please women.” She maintained that the majority of filmgoers in Britain were women and that filmmakers programmed for them. I do know this: Iris Barry was often poor. She arrived in New York at the onset of the Depression with a great wardrobe but not much else. I admire her courage in striking out on her own this way, but the experience doesn’t sound pleasant. Her close relationships were stormy. She seems to have been drawn to men who abused or neglected her. 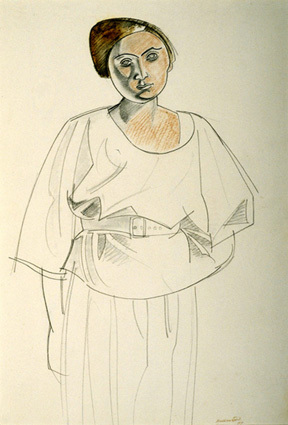 The most significant example of this phenomenon (and probably the most significant man in her life) was the poet and artist Wyndham Lewis, with whom Barry lived from 1918 to 1921. Lewis was a stereotypical Bohemian artist of his period—temperamental, unfaithful, and occasionally just plain mean. He and Barry had two children, both of whom were farmed off to others to raise. Barry married twice—once in London to a poet named Alan Porter; the second time in New York to John Abbott, a financier who was an administrator at the Museum of Modern Art and technically supervised her, although it seems clear that she was the one in charge of the Film Library. Neither marriage lasted. In the late 1940s at the Cannes Film Festival she met Pierre Kerroux, a Frenchman who was apparently working as a smuggler at the time. She lived with him in Fayence at the end of her life. At least one friend of hers I interviewed at the time of my master’s thesis was concerned that Kerroux abused her physically. The two had few resources on which to draw. Barry’s occasional work for the museum could not have supplied much income. And she clearly had a drinking problem by the end of her life if not before. Love she really knew very little about. That is the misfortune of women, that they have an appetite but no natural genius for it…. It is simple enough for a man to be attracted by a woman; but so very hard for him to accept her as a human being. And, I long have had the sense that she didn’t suffer fools. Barry also managed to balance the compromises required of working within established institutions yet also mining a deeply personal passion. I don’t think she was always the most likable person in the room. But, she was bold, proud and uncompromising. I don’t wish for Iris Barry’s life—the poverty, the difficult relationships, the willingness to strike out blindly on new courses without thinking them through. Nevertheless, I do envy her passion: for film, for art, for preserving beauty and culture. I celebrate her achievements as a critic and a curator. And I admire her poetic soul. The effect, all too little realized at the time, was as though something that mattered very much had somehow and rather miraculously been preserved round that table when so much else was being scattered, smashed up, killed, imprisoned or forgotten…. It was, for the hours the gathering lasted, less important that so many were being killed and more that something lived: possible to recall that for every Blenheim there is a Voltaire and that the things that endure are not stupidity or fear. Iris Barry herself accomplished “something that mattered.” And she was someone who mattered. Happily, Barry is beginning to achieve the recognition she deserves. 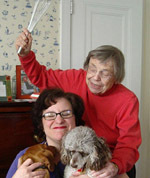 Haidee Wasson and Leslie Hankins have both published journal articles examining her writings. Jillian Slonim is finding everyone she can (and every piece of paper she can) to shed light on Barry’s life and work. 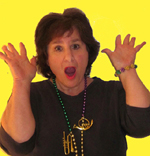 Jill reports that MoMA is planning to launch a “Modern Women” exhibition in Spring 2010 that will include some of Barry’s original programming. More intimately, perhaps, with Jill Slonim’s help the town of Fayence, France, held a “Jour Iris Barry” last fall. On this day Fayence celebrated its late resident and officially named the movie theater in the town’s new cultural center after her. If like Iris Barry YOU have a passion for film, please consider donating to the National Film Preservation Foundation. 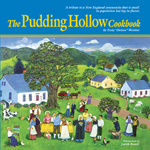 The NFPF is giving away four DVD sets to donors chosen in a random drawing this week. 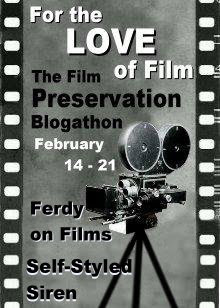 And of course please do visit some of the other bloggers who are writing this week For the Love of Film. Meanwhile, here is a (vaguely) Iris-inspired recipe. Iris did like to eat though she went through many periods in which she could not afford to eat well or what she might have wanted to eat. I seem to remember reading something she wrote in her later years–when she lived in Fayence–about liking asparagus but won’t be able to check that until I’m back home…too late for the blogathon. I turned to Haidee Wasson, who told me of Barry’s “tea habit.” Apparently, she enjoyed afternoon tea, particularly in her London days. 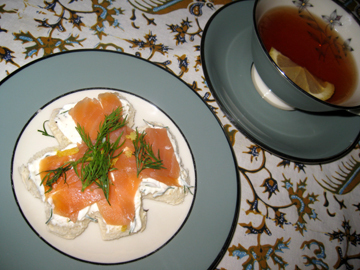 So I brewed a pot of tea and made some smoked-salmon tea sandwiches. I’m sure that when Barry was doing well financially she enjoyed them. I hope you enjoy them, too. And I promise my next post will be MUCH, MUCH shorter than this one……. I started to write down exact proportions for these little treats, but I gave up on that idea rather quickly because like most tea sandwiches they are best assembled to taste. I just stirred lemon zest, dill, and pepper into the cheese until it tasted delicious but not too strong. If you want to vary the recipe, you may certainly add capers to the cheese and/or garnish. And if you’re like my mother (who adores butter), you may add a layer of butter underneath the cheese. If you want to, cut your bread into pretty shapes. Since Saint Patrick’s Day is coming up, I used shamrocks. Cut off the crusts even if you don’t make shapes. In a bowl thoroughly combine the cheese, most of the dill, most of the lemon zest, and the pepper. Spread the cheese mixture generously onto the pieces of bread. Top with salmon and a bit more dill and lemon zest. Brew up a pot of tea and watch an old film.